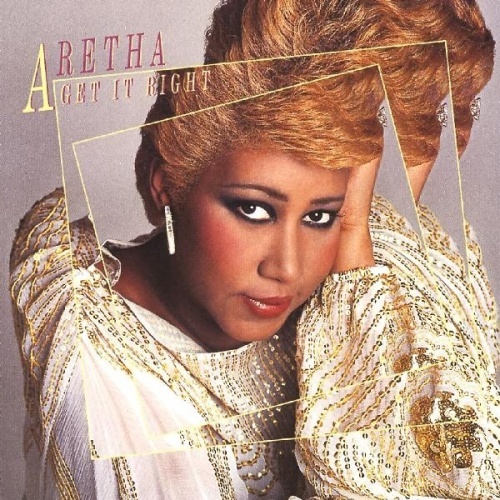 Get It Right is the thirty-second studio album by American singer Aretha Franklin. It was produced by Luther Vandross, following his successful teaming with the singer for the Gold-certified album, Jump to It, in 1982. The disc’s title song became a #1 hit on Billboard‘s R&B singles chart – knocking Donna Summer out of the top spot – but it stalled at only #61 on the Billboard Hot 100. The album was a critical and commercial failure, selling about 200,000 U. S. copies. It was belatedly issued on compact disc in the late 1990s. Aretha Louise Franklin (March 25, 1942 – August 16, 2018) was an American singer and pianist. She began her career as a child singing gospel at New Bethel Baptist Church in Detroit, Michigan, where her father, C. L. Franklin, was minister. In 1960, at the age of 18, she embarked on a secular career, recording for Columbia Records but achieving only modest success. After signing to Atlantic Records in 1966, Franklin achieved commercial success and acclaim with songs such as “Respect”, “Chain of Fools”, “Think”, “(You Make Me Feel Like) A Natural Woman”, “I Never Loved a Man (The Way I Love You)” and “I Say a Little Prayer”. By the end of the 1960s she was being called “The Queen of Soul“. Franklin recorded acclaimed albums such as I Never Loved a Man the Way I Love You (1967),Lady Soul (1968), Spirit in the Dark (1970), Young, Gifted and Black (1972), Amazing Grace (1972) and Sparkle (1976) before experiencing problems with her record company. After her father was shot in 1979, she left Atlantic and signed with Arista Records, finding success with the albums Jump to It (1982) and Who’s Zoomin’ Who? (1985), and her part in the 1980 film The Blues Brothers. In 1998, Franklin received international acclaim for singing the opera aria “Nessun dorma” at theGrammy Awards that year, replacing Luciano Pavarotti. Later that year, she scored her final Top 40 song with “A Rose Is Still a Rose”. Her stage performance at theKennedy Center Honors in 2015 was highly praised. Franklin recorded 112 charted singles on Billboard, including 77 Hot 100 entries, 17 top-ten pop singles, 100 R&B entries and 20 number-one R&B singles, becoming the most charted female artist in the chart’s history. Franklin’s other well-known hits include “Rock Steady”, “Call Me”, “Don’t Play That Song (You Lied)”, “Spanish Harlem”, “Bridge over Troubled Water”, “Day Dreaming”, “Until You Come Back to Me (That’s What I’m Gonna Do)”, “Something He Can Feel”, “Jump to It”, “Freeway of Love”, “Who’s Zoomin’ Who” and “I Knew You Were Waiting (For Me)” (with George Michael). She won 18 Grammy Awards, including the first eight awards given forBest Female R&B Vocal Performance from 1968 through to 1975, and is one of the best-selling musical artists of all time, having sold more than 75 million records worldwide. Franklin received numerous honors throughout her career, including a 1987 induction into the Rock and Roll Hall of Fame, becoming the first female performer to be inducted, National Medal of Arts and the Presidential Medal of Freedom. She was inducted to the UK Music Hall of Fame in 2005. In 2012, she was inducted into theGMA Gospel Music Hall of Fame. Franklin is listed in at least two all-time lists by Rolling Stone magazine, including the 100 Greatest Artists of All Time, and the 100 Greatest Singers of All Time. She was ranked by Rolling Stone as the No. 1 greatest singer of all time.